Well, shoot. Copperhead, you son of a gun, you can still find ways to surprise us. Closing out the second arc of this tonally deft space-western, Faerber, Godlewski, Riley and Mauer poignantly zigged when you thought they were zagging. What was shaping up to be something more akin to a thundering root’em, shoot’em save-our-guy triumph instead revealed itself to be far more eloquently somber? 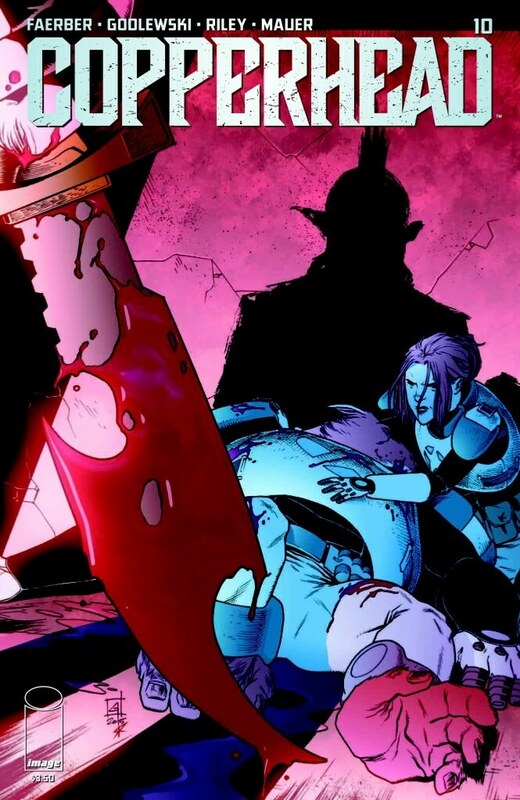 Oh sure, there’s some fantastic saloon brawling and palpable hostage situation tension to revel in, but Copperhead #10 closes out with a glance towards bonds, responsibility and the weight of choosing what path to walk down. Even the bad guys can be their brother’s keeper and morality isn’t as cut and dry as those harsh Western winds. It’s not all somber, not by any means, and Faerber’s script blends action movie badassery with some good old-fashioned subterfuge. Actually, remember the joy of seeing the Cantina scene in Star Wars for the first time? Imagine that but with a little less music and a lot more brawling. 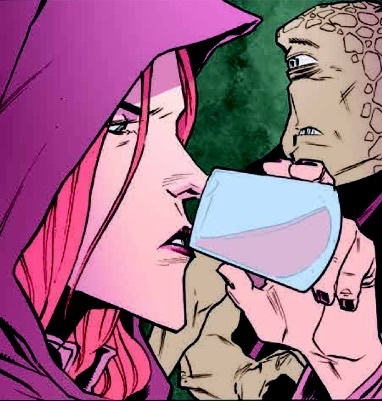 Faerber also continues to tease the inevitable appearance of Clara’s husband to a degree that’s reached the precipice of creating perfectly leveled anticipation and is teetering towards “let’s get to this, already!” Bottom line is that it’s easy to go with fun that allows for established characters to what they do best (i.e. give no fucks and get the job done) and let the supporting characters do the heavy thematic lifting. Faerber’s focus on the brotherly bandits and their roles both in the outlaw life they’ve chosen and as family serve as an askew mirror to Boo and Clara’s relationship. Or perhaps even to their relationship’s to their family, or to their people. It examines if the path we walk is the only one we’re allowed to once we’ve chosen it and what level of responsibility others have to let them walk it. It’s an interesting study and a surprising way to end the second arc. At first, it does admittedly at first feel like the main narrative fizzled out at the end. What looked to be a rescue mission turned out to be more of a “stand and witness what the hostage takers do” mission. But that’s sort of the great thing about the conclusion too; true to its revisionist Western grit roots, this isn’t the Spaghetti-styled guns blazing paint by numbers. No, it’s quieter, it’s moodier, and it packs a lot more punch than the typical superhero fare that sits alongside it. Oh yeah, and then the final page closes it out with a hell of a bang that’ll make you equal parts pissed and giddy about having to wait for the next issue. That double-page splash by Godlewski is your new spirit animal. Complete with full-on Clara doing a “but that’s none of my business” sip, it’s a high-energy, richly populated, and tightly paced example of why Godlewski is so damn good. His pencils and inks look as sharp as ever and he plays with angles throughout to maintain a cinematic intensity. As always, his panel layouts control the pacing to an impressive degree; allowing room to breathe or rapid fire overlapping (during Boo breaking his chains for instance) to keep the eye in a controlled yet frantic state. Panel borders alternate depending on tone between traditional and jagged and he plays with their shape to match the flow of action occurring within like when Clara delivers a well-earned punch to Nestor’s face. Zoom-ins and outs, shots wide and tight, silhouettes and upshots and down shots, Godlewski’s pages form a cohesive, rhythmic whole that has its crescendos and its diminuendos naturally flowing. Stylistically, it’s the same stellar character work and atmospheric conscientiousness we’ve come to expect. All manner of alien designs run amok and each are wonderfully expressive, but as always, none more so than Clara herself whose smirks, grimaces, and stares speak volumes. The texturing of Zolo’s scarred face continues to be fascinatingly mesmerizing (and also gross). Whether it’s the barren setting or a time issue, there’s a few sparse backgrounds this go round, but it still feels like a realized world regardless. It’s a lived-in place and sometimes that’s best delivered in the form of grit and atrophy that Riley’s colors bring so well. Riley’s palette is what’s most noticeable at first glance; how could it not be with its spectrum of luminescent hues. Spectral greens and magentas set the tone for an otherworldly feel, but gently give way to the more primary saturated warmth of Boo or Clara. Riley adds all the texture necessary to remind you that the futuristic gleam of technology has worn and the clayed structures constructed alongside them aren’t necessarily faring much better. Quite a bit of the issues takes place in the shadows and Riley allows for the figures to pop against the shadows while largely handling the light sources mindfully. Those panels with less detailed backgrounds provide the opportunity for Riley to strike the emotional stress necessary with a striking flash of gradient tones or a friable layered sponge texture.